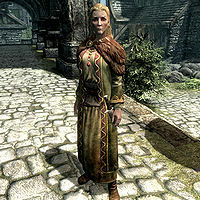 Pantea Ateia is an Imperial bard and teacher at the Bards College in Solitude. She is an experienced flute-player from a long line of them, as her instrument has been passed down for seventeen generations. Pantea Ateia wears a set of fine clothes and a pair of fine boots. She also keeps a belted tunic on her, though she won't wear it. She wields an iron dagger to defend herself if threatened. She also carries a key to the Bards College and a selection of higher-class items and gold. This page was last modified on 20 March 2013, at 05:07.